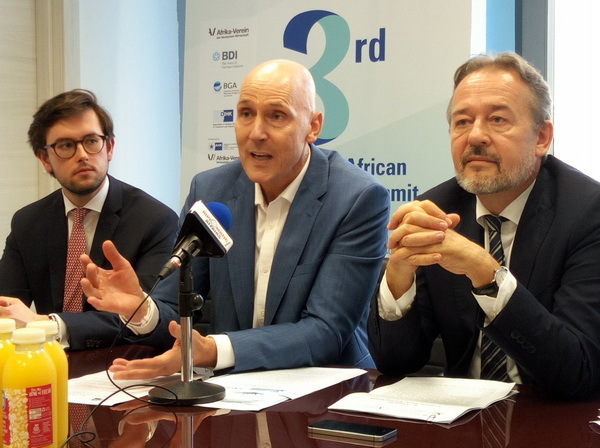 Over 500 German and sub-Saharan African high-ranking business executives and government representatives have arrived in Ghana for the third German-African Business Summit (GABS). The three-day Summit will focus on new opportunities and also learn from already existing experiences of German-African business relations. The German Federal Minister for Economic Cooperation and Development, Dr. Gerd Muller and Deputy Minister for Economic Affairs and Energy, Mr. Thomas Bareib have arrived in Accra for the Summit. At a media briefing at the Octagon building in Accra, the German Ambassador to Ghana, Dr. Christoph Retzlaff said GABS is Germany’s signature business event in Africa, at which top business and government leaders from Germany and dub-Saharan Africa meet every two years in Africa to discuss and promote economic relations. The Ambassador noted that the Summit was a huge chance for German businesses to invest in Africa. He disclosed that German investments sought to create jobs in African countries and transfer technology to the continent. Currently, he said, Germany exports goods at a volume of US$14 billion to Africa and imports goods valued at US$12 billion annually. The Ambassador was happy to note that Ghana was a major development partner of Germany. The Head of the Delegation of the German Industry and Commerce in Ghana, Dr. Michael Blank stressed the importance of finance to every business. He observed that GABS does not only focus on traditional business linkages and business models, but also brings together players of Africa’s new economy known as start-ups. As part of the progamme line up for the Summit, a German Desk that will enable companies to gain access to financial support and solutions has been established. The desk was established by the Delegation of German Industry and Commerce (AHK) Ghana, the DEG, the private sector investment branch of Germany’s development bank KFW, together with its development partner, Access Bank Ghana. The Head of the Ghana office and West Africa Equity of the DEG, Mr. Mackenzie Schow said the German Desk enables companies to gain access to financial support and services.